William McMath was born on 23rd Sep 1858, Craigmark , Dalmellington the third born child of George McMath and Jane Gray. His parents were both born in Sanquhar, Dumfriesshire and it was there that his eldest sister Jane was born (1853) before sister Helen (1855) was born in New Cumnock. Younger brother George (1860) was born at Kirkconnel before the family returned to live at Dalmellington. In 1861 the McMaths and their family were living at Park Yett Row, Waterside Dalmellington where father George worked for the nearby Dalmellington Iron Works, as an ironstone miner. The couple made the short move to Craigmark and in 1863 were married where a third son, Archibald (1864) was born the following year. On the 6th May 1865, 36 year-old George McMath was killed at Drumgrange No. 10 Pit, by a fall of stone, leaving widow Jane with five children, aged from 1 to 12 years old; with a son James on the way, born at Lethanhill, Dalmellington three months later. The young widow, now living with her children at Burnfoothill, Dalmellington married miner William Montgomery in 1866 and the following year a son William (1867) was born. The family moved to Connel Park, New Cumnock where son John (1870) was born and soon after settled at the Castle in the village. 11 year-old William McMath worked at the South Boig pit now under control of the Lanemark Coal Company and probably in his first year underground, but maybe not. The Mines and Collieries Act (1842) prohibited boys under ten years old from working underground in coal mines and resulted in no females being employed underground. Young William may possibly have worked alongside his step-father William Montgomery as his ‘quarter-man’. 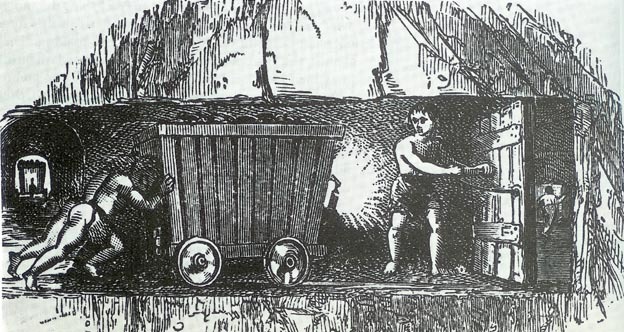 “When a boy of twelve years enters a coal pit, he is attached to his father or some other man, and becomes what is known technically as a “quarter-man.” The miner with whom he works is entitled to put out one-fourth more coal than if he worked without assistance ; and from the price received for the extra quantity he pays the boy, whose duty it is to fill the coal into the “tubs ” and convey it to the pit bottom. The shilling a day would have been a welcome addition to the income of the household with five children younger than William, in an age range of 0 – 10 years old. Sadly, tragedy struck on 5th August 1870 when William McMath, while working underground probably filling hutches of coal, suffered the same fate his father George had some five years earlier and was killed by a roof fall, crushed to death by a fall of coal. The cause of death was recorded as ‘injuries sustained to him while employed in Boig coal pit, certified R.G. Herbertson L.R.C.P.’. It is interesting to note that William’s fatal accident entry in the Scottish Mining Web-site recorded that he was 14 years old when he was killed. This may possibly be the age he was claimed to be when the family settled in New Cumnock, perhaps to earn the two-shilling wage of a “half-man” rather than a shilling as a “quarter-man”. However, from his birth certificate William McMath was 11 years and 316 days old when he was killed underground. The McMath / Montgomery family moved and settled in the USA soon after. David Bremner, The Industries of Scotland: Their Rise, Progress and Present Condition (1869) – Courtesy of Scottish Mining web-site. Text © Copyright Robert Guthrie. All content on the site is the property of newcumnockhistory.com (unless otherwised stated) and cannot be copied without the permission of site owner.